Amazon recently reduced the price of new Samsung Galaxy S II Skyrocket 4G smartphone which is now available for a price tag of $99.99 along with a new 2-year contract.Initially the Amazon price was $249.99 with same 2 year contract. 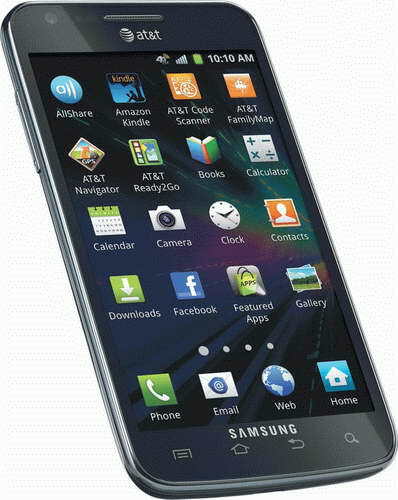 Samsung Galaxy S II smartphone is one of the company's high end smartphone.AT&T version of the Samsung Galaxy S II smartphone is named as Skyrocket 4G.The smartphone also support AT&T’s new ultra-fast 4G LTE network. Lets take quick look into the specifications and features of Samsung Galaxy S II Skyrocket 4G smartphone.The Samsung Galaxy S II equips a 4.5-inch Super AMOLED Plus multi-touch display with 480 x 800 resolution and is powered with a dual-core 1.5GHz processor along with 1GB RAM. New Samsung Galaxy S II Skyrocket 4G smartphone runs on Android 2.3 Gingerbread OS and other features includes 8 MP autofocus LED flash rear camera, 2MP front camera, 16GB internal memory, Wi-Fi 802.11 a/b/g/n, Bluetooth, GPS, microSD card support (up to 32GB) and HDMI port. Tags:-Samsung Galaxy S II Skyrocket 4G smartphone new price, amazon price of Samsung Galaxy S II Skyrocket 4G smartphone, new reduced price of Samsung Galaxy S II Skyrocket 4G smartphone, new price of Samsung Galaxy S II Skyrocket 4G smartphone by amazon, Samsung Galaxy S II Skyrocket 4G smartphone amazon new price.